and I wrote a book! you find here all you need to get data from around the word into R, using social networks API but also developing custom functions to access specific APIs you need. Data import from nearly every kind of file is also covered, giving you hints on how to streamline your analyses. within this section you discover how to give your data a tidy structure, which is a structure where each row is an observations and every column host and attribute (yeah yeah, we are talking about tidy data framework by hadley whickam). no matter if you are within the exploratory data analysis phase or production stage, data visualisation is a core step of your work (I know you already know this, but let me make it a bit more commercial, come on…), that’s why a whole section is devoted to show you basic and advanced visualisation techniques, like great Sankey diagrams and 3D animated plots. 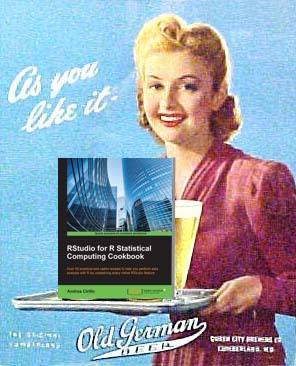 domain specific applications is were R really shines, and you find here nearly a dozens of great R language applications, from text analytics on PDFs to benford analysis on ecommerce data and reccomandation engine modelling. 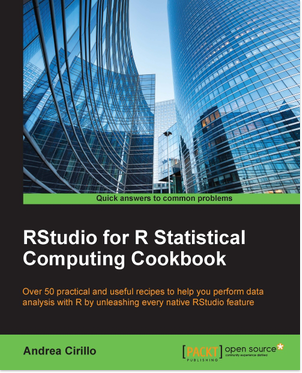 We could have named this section “Rmarkdown is everywhere”, since within this chapters the reader is introduced to all possible flavours of this powerful tool provided by Rstudio guys. One of my favourite recipe is the one which shows you how to publish and curate a blog directly from Rstudio. Packt publishing provided for your convenience a free chapter which will let you get a first sense of how the book is structured and conceived. you cane easily find it on slideshare. Summing it all up: If you are looking for a way to get from good to great with R this book is going to be a good companion to your journey, or at least this was my objective 😅. And if you are thinking if it is worthing to spend a sum of money for me, well,** don’t forget I am now dad of three voracious babies** :).